Updates 2017 and 2018: Phnom Penh is developing at a rapid rate and, unfortunately, some of the structures listed in the original post (published in 2016) no longer exist or are being redeveloped. I’ve added a comment next to the applicable building in the body of the text below. 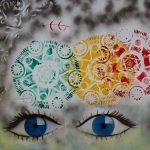 If anyone has any future updates, I would be grateful to hear from you. Also, during our last time in the city (February 2018), we made our way to the Royal University of Phnom Penh and a brief description, along with some photos, has been added at the bottom of the post. I would highly recommend a visit if this style of architecture interests you. I’m going to begin by saying that we cannot take any credit for the contents of the walking tour of Phnom Penh which I am about to showcase. During our recent extended period in Cambodia’s capital, we stumbled across a superb company called Khmer Architecture Tours. 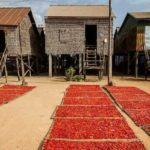 They offer some fascinating guided walking and cyclo tours of the city’s modern and colonial architecture for very reasonable prices. 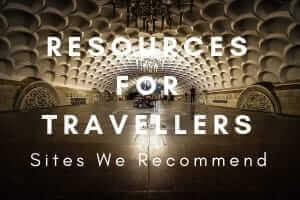 Guides tend to be a mixture of students of architecture, researchers as well as local and expat architect enthusiasts. This kind of thing is right up our street (if you’ll excuse the pun) but unfortunately, we missed out joining one of their guided tours because they are mostly offered at the weekends and the timing didn’t quite work out for us. All was not lost, however, as Khmer Architecture Tours also provide a free map (with brief descriptions of what you are looking at) which allows you to undertake your own self-guided walking tour of the city’s most interesting buildings. For copyright reasons, I cannot replicate the map (or descriptions) in this article but it can be downloaded as a pdf here. We followed the suggested route, which took around three hours to complete, to the letter but also went further afield to see other structures of note such as the Chaktomuk Conference Hall, Independence Monument, the White Building, the National Olympic Stadium and the Railway Station – all recommended if you have the time. 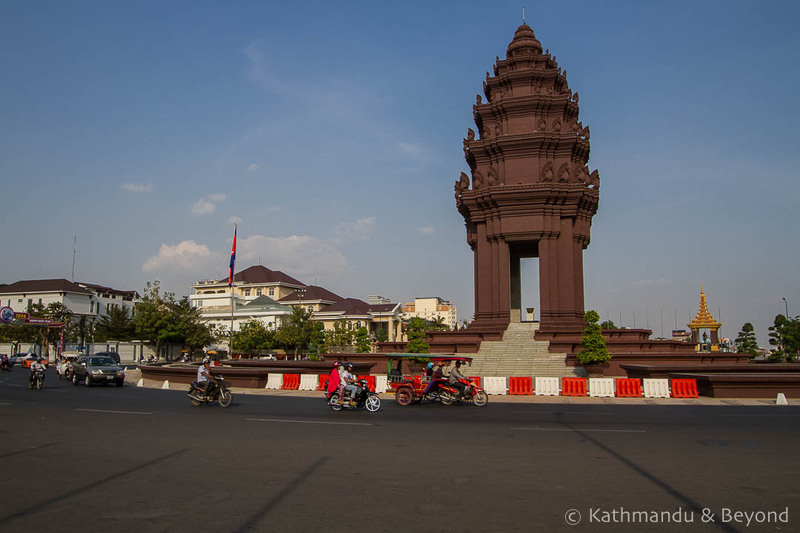 It isn’t until you start this self-guided walking tour that you realise what a fascinating city Phnom Penh is, architecturally. 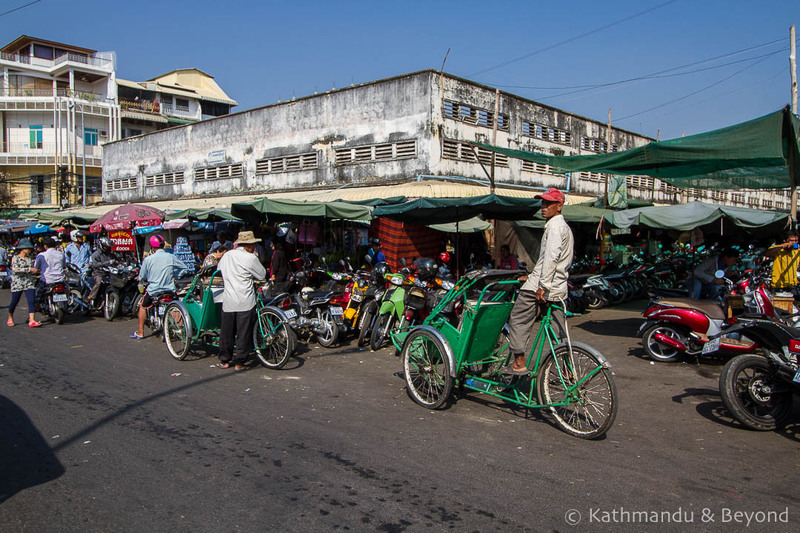 The city is an diverse mix of French colonial buildings and New Khmer Architecture, the latter being a phrase coined to describe the wave of architectural flourish that combined Khmer tradition with Modernism in the 1950s and ‘60s. Update February 2018: The Royal Villa (pictured above) is currently being redeveloped as a Hyatt Regency Hotel. Fortunately, the distinctive yellow-facade is not being demolished but rather incorporated into the hotel’s design. The hotel is due to open in 2020. 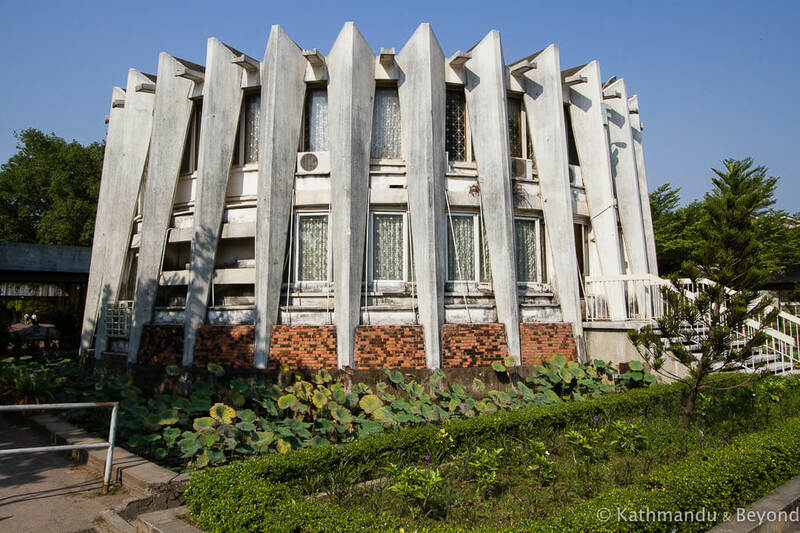 In fact, we became particularly interested in the New Khmer Architecture movement of the 1950s and ‘60s. This was a golden period for Cambodia. The Kingdom had gained its independence from the French (1953) and the then king/prime minister, Norodom Sihanouk, had an all-encompassing vision of creating a new, modern and progressive Cambodia that would be a key player on the world stage. This post-independence project was probably a tad overambitious but part of his plan involved the development of the country’s own unique style of architecture. A new generation of Cambodian architects (many of whom, not surprisingly, had studied in France) worked on the project over the following years but the foremost architect who would emerge as the driving force behind the movement was a man called Vann Molyvann, a gifted designer who was a favourite of Norodom Sihanouk and is still alive today (2016). 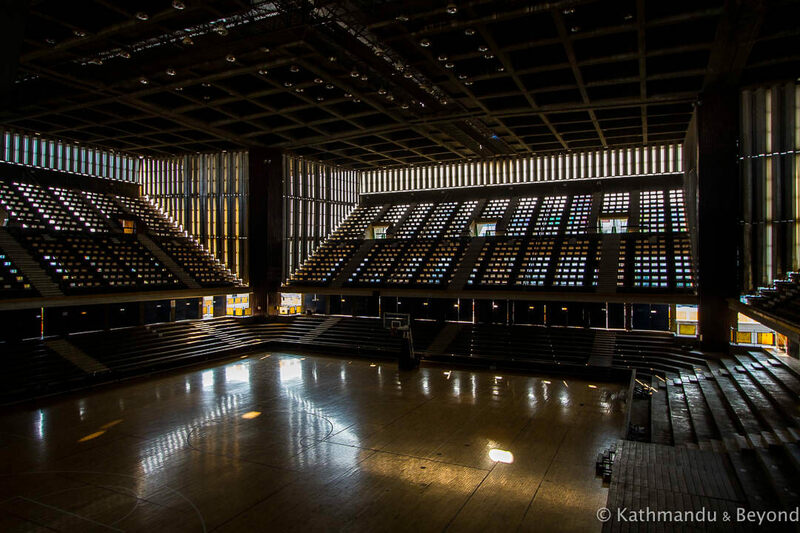 His legacy includes the Chaktomuk Conference Hall, the Independence Monument and the Olympic Stadium which, when completed in 1962, was the most coveted arena in all of Southeast Asia. You can certainly see distinct Brutalist design-influences in New Khmer Architecture, which is not surprising given the Brutalist movement was around at the same time. Reinforced concrete dominates many of the structures and it is obvious in lots of the designs that the French influence was still very much in the back of the architect’s minds at the time. There is even an element of traditional Khmer temples, of which the Independence Monument is a good example. New Khmer Architecture came to an abrupt end in 1970 when a US-backed coup lead by Cambodian military general, Lon Nol, ousted Norodom Sihanouk from power. Incredibly, many buildings of note in Phnom Penh survived the devastation of the Khmer Rouge, although some were destroyed by the regime and many of those that remain are visibly in poor shape, something that is all too evident when you follow the tour. In conclusion, though, Phnom Penh’s architecture is one of the reasons why we think it is the most fascinating city in Southeast Asia. 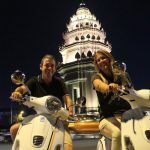 We would encourage anyone to undertake the self-guided walking tour put together by Khmer Architecture Tours or better still join one of their guided tours and learn even more about the city’s unique style of architecture. I have only commented on the photos below if I have something different/extra to add to the descriptions listed on the Khmer Architecture Tours downloadable map. Norodom Sihanouk was a huge fan of cinematography and produced more than fifty films throughout his lifetime. 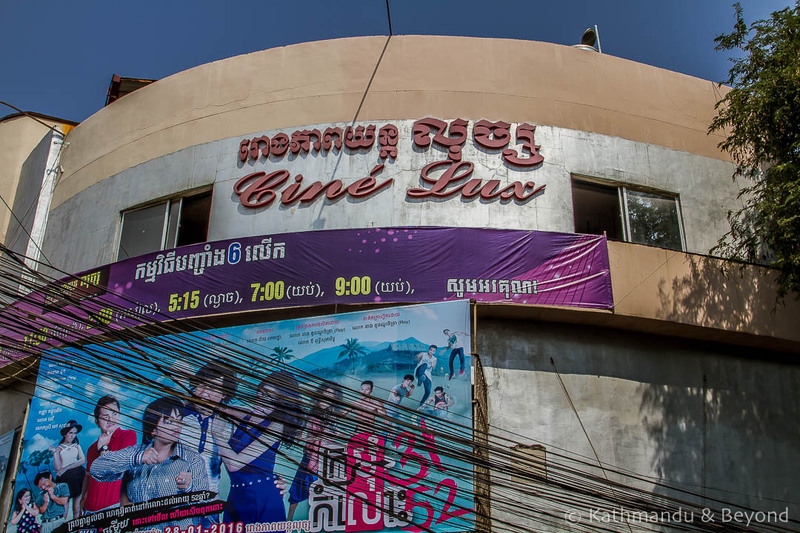 As a result, there are several cinemas in Phnom Penh dating back to the 1960s and beyond. The Capital Cinema was designed by Vann Molyvann. 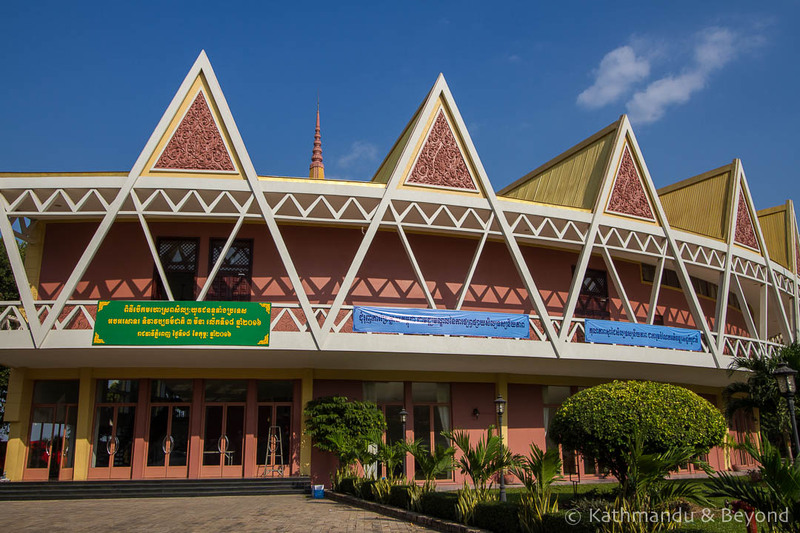 Located on the waterfront, this large conference hall was abandoned during the time of the Khmer Rouge but is in use once more. It is yet another Vann Molyvann creation. This building was home to the American Embassy until 1965 when diplomatic relations between the two countries broke off for the first time. The second and only other time to date that diplomatic ties were broken was in 1975, just before the Khmer Rouge came to power. 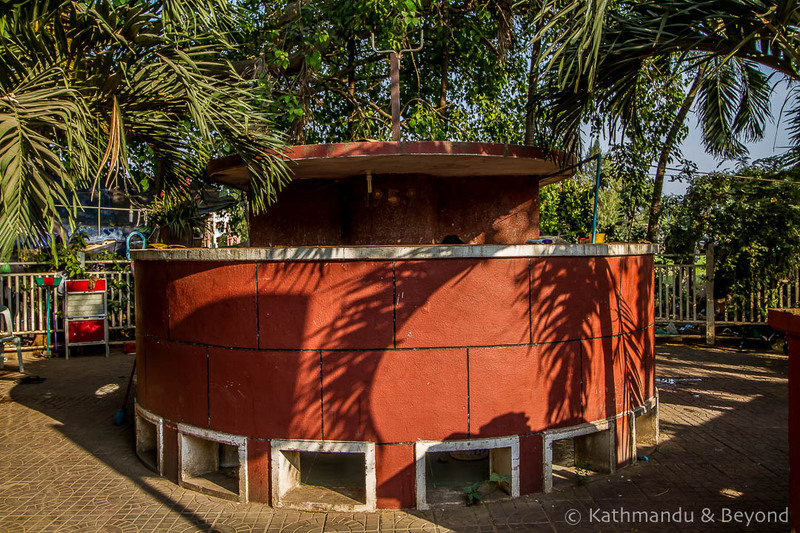 This public toilet is one of a pair situated at opposite corners of the open space in front of the National Museum. You can still use them to this day but I wouldn’t recommend it unless you are desperate! Update February 2018: Both toilets were demolished at some point in 2016/2017 as part of the redevelopment of Veal Preah Man, the former funerary complex of King Norodom Sihanouk. The Independence Monument was designed by Vann Molyvann in 1958 and commissioned to commemorate independence from France a few years earlier. There are no prizes for working out that it was modelled on the central tower of Angkor Wat. This building is directly opposite the Former US Embassy and was formerly used by the Americans as an operations building in the 1960s. 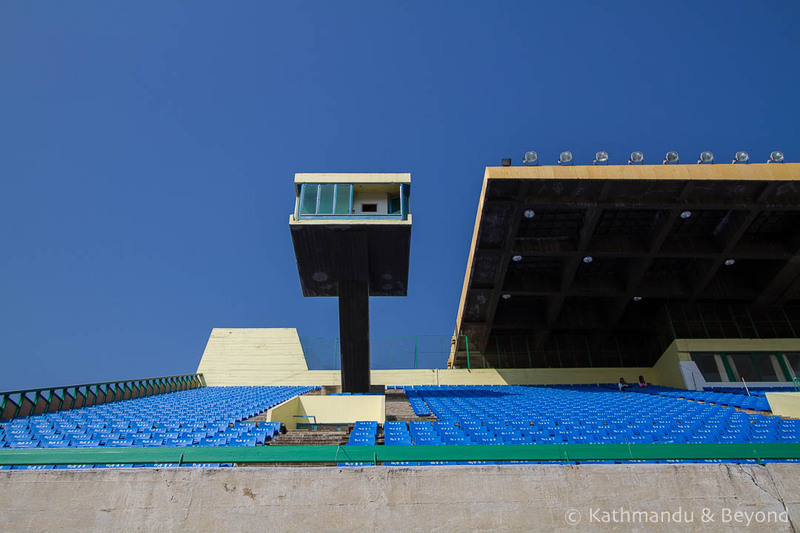 Also known as the National Sports Complex, this Vann Molyvann designed structure is still used for sporting events both at local and international level. The area around the stadium is prime real estate and when we visited (February 2016) practically the whole thing was encircled by massive building projects so whether its days are numbered as a sports centre or not is anyone’s guess? There is an interesting story on Wikipedia about how the stadium played a role in the 1966 football World Cup. You can read more about it here. Update February 2018: Don’t worry, this wonderful structure hasn’t been demolished. We simply made a return visit the last time we were in Phnom Penh and took some alternative photos, this time in the afternoon light, and I can’t resist putting them up! I particularly wanted to see the railway station, as it was from here that I embarked on my epic train journey to Battambang when I first visited Cambodia in 1992. The Mansion is a gorgeous French colonial-era building directly behind the Foreign Correspondents’ Club (FCC). In fac, the Mansion belongs to the same people who own the FCC and there is often an outdoor bar inside the grounds. The White Building was one of the largest apartment blocks to be established as part of Norodom Sihanouk’s vision for a new Cambodia. What you see in the photo is just one block out of six and in fact the whole area sprawls for quite some way along the street. The White Building was jointly designed by two architects, a Khmer and French-Russian, and the project was overseen by Vann Molyvann. The structure was built in 1963 to house moderate income tenants and in particular artists and their families, but many either fled during the time of the Khmer Rouge or were forced into the countryside as part of the regime’s ideology of a peasant utopia and the building never returned to its former glory. All six blocks are still in use and house an estimated 2500 tenants but most of them are poverty stricken and the housing project has a reputation (which is not necessarily justified) for prostitution, drug use and other such vices. Update 2017: The White Building was demolished in the summer of 2017. 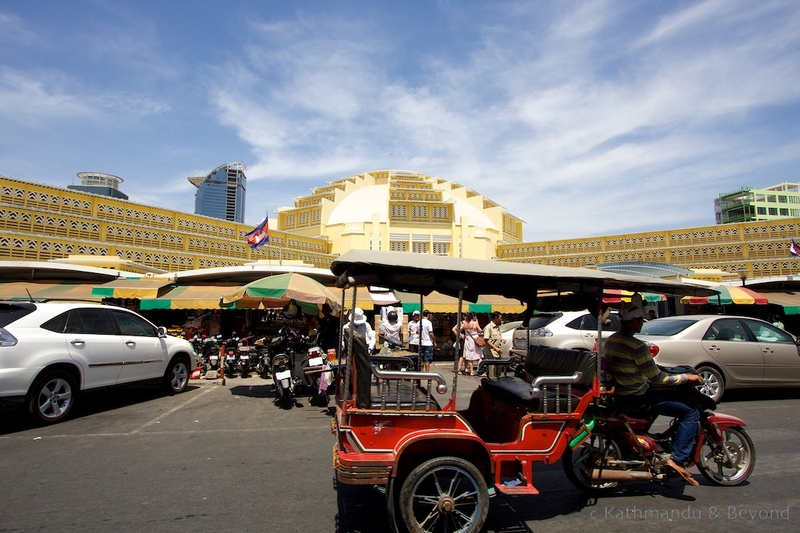 Phnom Penh’s busy Central Market was constructed in 1937. Its large central dome was designed to allow maximum ventilation, and has four limbs extending from it. Confusingly, Psar Thmei translates as New Market. First opened in 1929 simply as ‘Le Royal’ and closed for a period of just over twenty years following the Civil War in Cambodia, today this hotel is Phnom Penh’s premier luxury hotel and a city landmark. Dating from the ‘30s, the Lux still survives as a cinema today, showing mostly Khmer movies and horror movies from Thailand and Hong Kong. 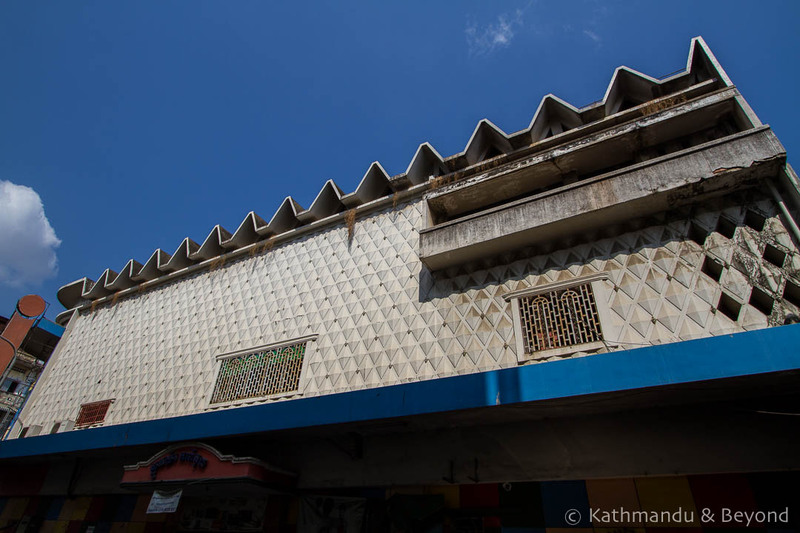 Modernist in style but not much to look at from the outside, bustling Phsar Kandal is a great local market to explore. 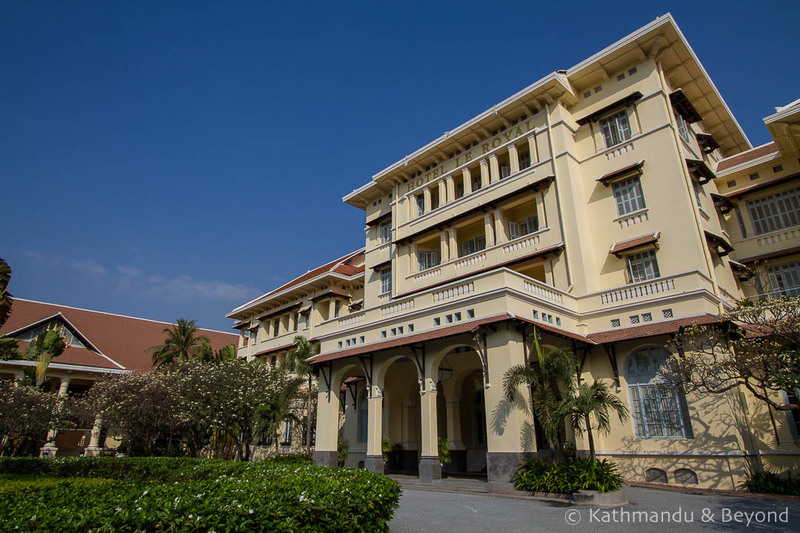 Because of it’s out of the way location (the university is closer to the airport than the riverside), the Royal University of Phnom Penh is not part of the downtown self-guided walking tour (*), but, the complex is certainly worth venturing out to see. 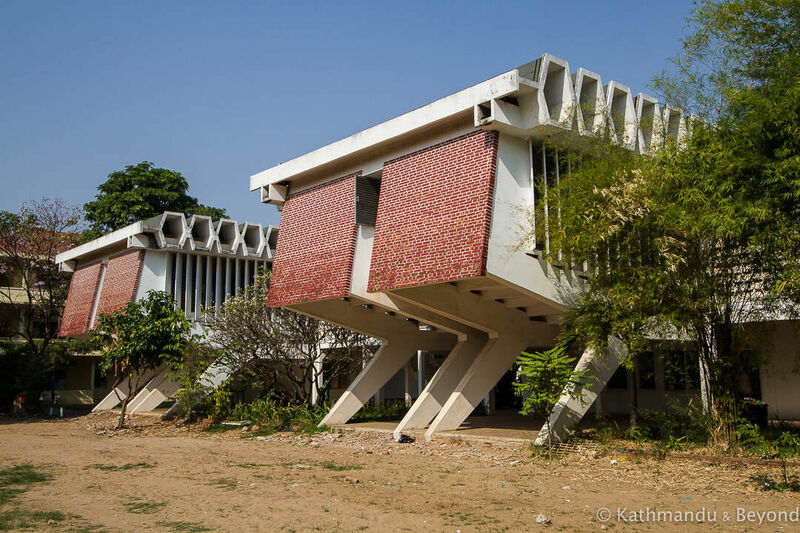 Established in 1960, many of the university’s faculties were built between 1965 and 1975 in the style of New Khmer Architecture, although the campus’s most distinctive building, the Institute of Foreign Languages, was added in the early 1980’s, after the fall of the Khmer Rouge. (*) Khmer Architecture Tours do have other tours that include the university and it can be incorporated into any bespoke itinerary. If you follow Khmer Architecture Tour’s suggested route, you will pass many examples of apartment blocks, mostly built in the 1940s, 50s and 60s and their pdf download does a great job of explaining the different styles of Phnom Penh architecture from French colonial to art deco to modernist. That was very interesting. I am much more of a fan of Cambodia’s colonial and art deco architecture than the concrete monstrosities of the 1950’s and ’60’s. Brutal indeed. 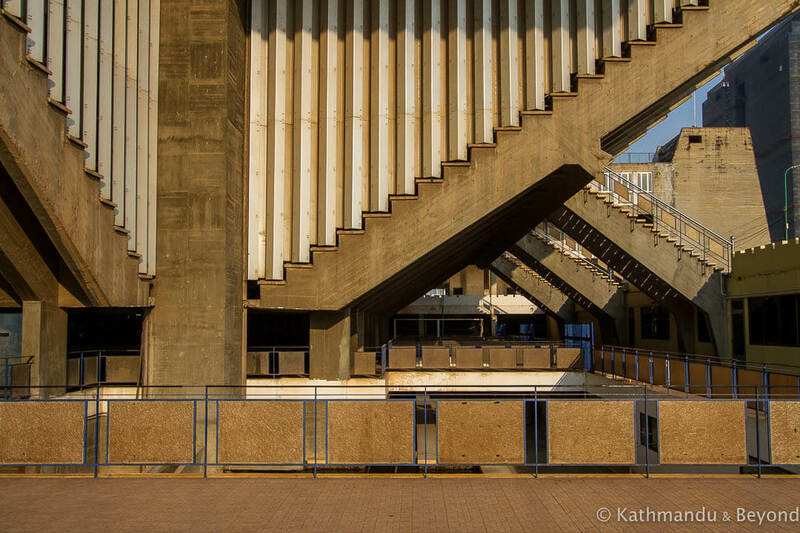 Reminds me of the horrific Le Corbusier buildings in Chandigarh in India. But, de gustibus non disputandum. And I will certainly take your advice and try to do this walking tour if I ever return to Phnom Penh. Thanks.